So I don't normally do book hauls because it is rare that I get a lot of books in one go but clearly June was an exception! After finishing my exams I decided to treat myself a little bit and get some books since I've not been able to read much for ages because of the exams! I took a little trip into Waterstones while I was in town one day and decided to get a few holiday reads. When I'm on holiday I like to read things that are easy to fly through and don't take much thought which usually means I go for something YA and romance. I picked up My Life Next Door by Huntley Fitzpatrick because I'd heard people talking about it and thought it fitted the occasion. I also saw a stand of books on 2 for 1 and couldn't resist so picked up If I Was Your Girl by Meredith Russo purely because it said on the back it is about someone who is transgender and I've never seen any books on this topic and The Square Root of Summer by Harriet Reuter Hapgood because it seemed like my kind of summer read. I couldn't resist buying a few books online. I got Everyday Sexism by Laura Bates (not pictured because I forgot it was in my currently reading pile-oops!) which I am currently reading and loving. It essentially states the facts proving sexism is still a huge issue in our society and uses statements from real people to explain the facts. I love the way its written and will definitely be reviewing it when I'm done with it so keep an eye out for that! I also bought Room by Emma Donoghue and A Little Life by Hanya Yanagihara because I've heard so much about them. With both of these books I've heard them mentioned everywhere and every time I am interested and want to read them. I decided it was time to finally buy them and I'm going to try not to get intimidated by the size of A Little Life and actually read it! 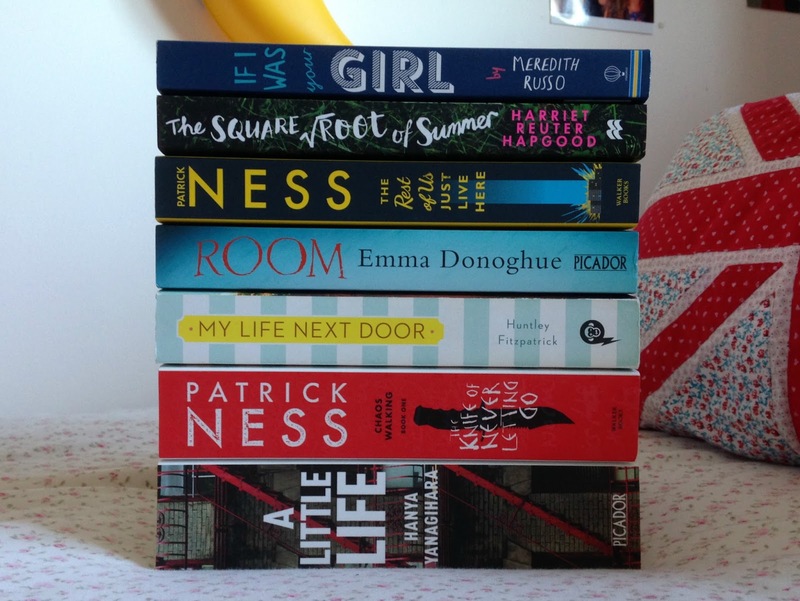 I also bought two books by Patrick Ness, The Knife of Never Letting Go and The Rest of Us Just Live Here. After reading A Monster Calls I was craving more Patrick Ness and after a conversation with a friend who shares my love for his writing (thanks Sophie!) I settled on these two to read next. I absolutely loved A Monster Calls so I'm hoping I enjoy these just as much! So there we go! All the books I bought in June! Have you read any of these? If you have, what did you think of them? If not, would you like to read any of them? Let me know in the comments!